In the early years of Fair Oak Workshops we sold beautiful Cobre� Copperware hand wrought from solid ingot by skilled craftsmen in a small Mexican village. Well crafted copperware display�s the artist�s eye in execution of the form, his skill in hammering and his knowledge of the metal. The craftsmen of this village were able to faithfully interpret the look and feel of yesterday�s Arts & Crafts period copperware producing contemporary pieces so true to form they could substitute for the original antiques. And since these pieces are raised from a single ingot, there are no seams and they are watertight. 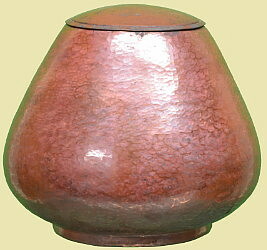 Cobre� copperware patina is a heat treated reddish brown finish which will age nicely. As was always our practice, we saved a sample of the better design and crafted pieces and once again we have encountered this new stash of old inventory. Some shape names are Cobre�s, others are what Fair Oak Workshops thought appropriate. In a few cases, some of these pieces are lightly used. Prices are from our year 2000 Catalog! From the Roycrofters to Dirk van Erp, every Arts & Crafts home needs a distinctive piece of Copperware. And with exceptions as noted, there is only one of each of the shapes listed below; when they are gone they are gone! Please, all sales are final. Reminiscent of a Teco Pottery shape but much larger and very husky. An excellent accessory piece for the foyer or fireplace. Cobre stamp and craftsman signature. A project that never happened. We ordered lidded bowls to be used for lamp bases. We have 6 (our choice) but will negotiate quantity purchase. PLEASE NOTE: Click on any of the underlined item descriptions below for a larger photo.